Robin Holly, part of the "Red Holly" group, is an upright growing, pyramidal holly with striking maroon new foliage that becomes dark green and an abundance of red berries giving this evergreen selection a regal flair. 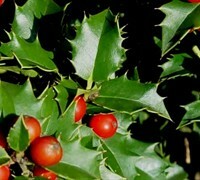 The habit and cold endurance is similar to Nellie R. Stevens holly but about half the size, maturing to 14 feet tall by about 8 feet wide. Robin Holly is tidy and polished in form making it useful as a specimen. It's dense enough that it works well planted in straight or curved rows as a visual, wind, and noise buffer. It would also be dramatic lining a drive or property line, clustered about an entryway, or to frame the corners of a taller home or other building. Prefers sun to part shade and well drained, moist, acidic soil. 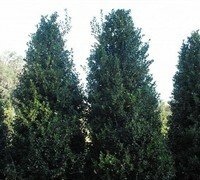 No pruning necessary however can be clipped to a more formal shape.